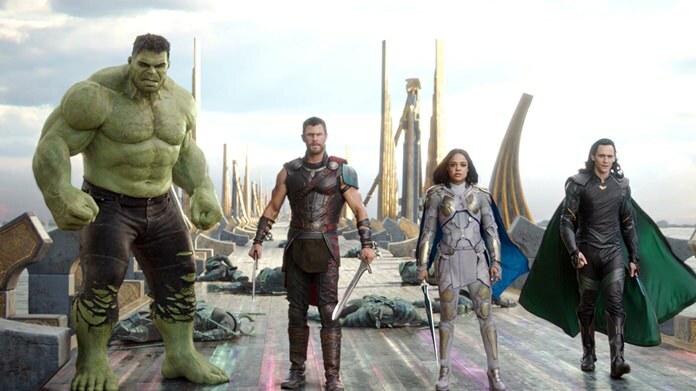 Los Angeles (AP) – In the stand-alone films of the Marvel Cinematic Universe Thor always seemed to get the short end of the stick. The Thor films were never as popular as Iron Man, and didn’t gain steam like Captain America. They were perhaps a little too serious and a little too dull — none of which was the fault of star Chris Hemsworth, whose performances in the role have been so seamless and charming that he almost doesn’t get enough credit. The movie literally splits in two at this point. Poor Blanchett, who has gone full vamp as Hela, is good as always but how lame it must be to be in the “fun” Thor movie and have to play one of the most blandly written villains ever. While she’s off waging her deathly serious takeover, Thor gets to join an irreverent comedy sideshow on the planet Sakaar — a sort of wasteland at the end of the universe run by a Grade-A weirdo who calls himself Grandmaster, played, fittingly, by Jeff Goldblum. I imagine “Thor: Ragnarok” is one that might improve on subsequent viewings, when you have a chance to relax with the jokes divorced from the pressure of juggling the silly/serious plot. But it’s a fairly flawed movie on the whole with egregious tonal shifts. Some of the gags go on too long with the Hulk with too little payoff and sometimes it seems as though there’s a mandate that every 25 minutes there will be a big fight no matter what. One particular army of the dead sequence seemed like it could have been lifted from a “Pirates of the Caribbean” movie — which is not the most flattering comparison. Previous articleIs this the end of Chinese JV’s?